An imposingly realistic vision of the old 1 World Trade Center, the ultimately doomed north tower, will begin appearing next month in a most unlikely place: the five special elevators servicing the observatory atop the new 1 World Trade Center. For less than four seconds (roughly proportional to the time the twin towers stood), jarringly familiar pinstripe facades will loom into view on one wall of the cab. Then, in a quick dissolve, they will evanesce. “The event is certainly a key part of history,” he said. “We did not think you could ignore it. Having it appear in the year it did and disappear in the year it did was the respectful way of addressing the fact that it was part of the landscape.” Two World Trade Center, the site of the original observatory, is also visible. Mr. Checketts acknowledged that the plan to confront sightseers with an image of the old tower spurred a lot of debate within his own company and with the Port Authority and the Durst Organization, developers of the new tower. “There were strong opinions and emotional reactions all around,” he said. Whether the public regards the depiction as a tribute, as sacrilege or as a simple matter of fact awaits the opening of One World Observatory on May 29. But from a documentary point of view, the brief presence of the original World Trade Center in the time-lapse sequence is consistent with its generally high degree of historical fidelity. 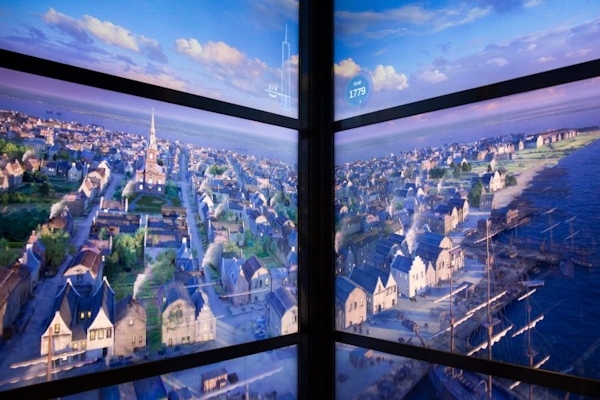 Nine 75-inch, high-definition monitors are arrayed in each cab behind windowlike mullions to convey the impression that one is in a glass-walled elevator. At first, one feels enclosed in bedrock. The year is 1500 and the elevator is 55 feet below ground. As it rises, time advances. The cab seems to head skyward from an offshore marsh, a reminder that the trade center site was originally underwater. A peaceful riverfront settlement is then seen, just before the Europeans arrive. Soon enough, the still verdant island is dotted with the steep, crow-stepped gables of New Amsterdam, as windmill vanes poke up over the treetops. Then, the steel framework of the new 1 World Trade Center seems to assemble itself around the cab before visitors once again find themselves within an enclosed space — this time, an elevator shaft. The descent experience is more fanciful. The elevator cab appears to leave the confines of the tower entirely and sail around it in a great arc before re-entering through windows that obligingly slide apart. That was another sensitive detail that had to be worked out carefully so as not to reawaken memories of 2001, said David Kerschner, the Legends president of attractions. The show was designed and produced by the Hettema Group of Pasadena, Calif., and Blur Studio of Culver City, Calif. The overall architect is Montroy Andersen DeMarco of New York. Mr. Kerschner said the elevators travel at 2,000 feet a minute, or 23 miles an hour. The observatory is 1,268 feet above ground, making it the third highest in the Americas, after the CN Tower in Toronto (1,467 feet) and the Willis — formerly Sears — Tower in Chicago (1,354 feet). The adult admission fee is $32.